Often the surgery for getting rid of glasses is not undertaken out of fear of dry eye. The need to use eye drops after laser surgery is caused by decreased eye surface sensitivity. Sensory nerve fibres are located largely in the superficial layers of the cornea. Both LASIK and surface ablation surgeries penetrate these superficial nerve fibre layers and the sensitivity of the surface of the eye decreases. Although in most cases sensitivity will recover about 90% within a year, the drops are necessary due to the dryness of the eye. This is annoying and inadequate tear film affects the quality of vision. Insufficient tear film may also cause epithelial thickening, which in turn leads to a small return of minus vision. In the new, third-generation SMILE laser surgery (Small Incision Lenticule Extraction), the corneal tissue is removed from deep layers and this damages a third fewer nerve fibres. Studies have found that eye surface sensitivity is the same on the day after the SMILE procedure as it is with LASIK surgery after 4 months. Only ReFocus Eye Clinic performs the next generation laser surgery in Estonia. The SMILE method makes it possible to get rid of nearsightedness up to -10 dioptres. 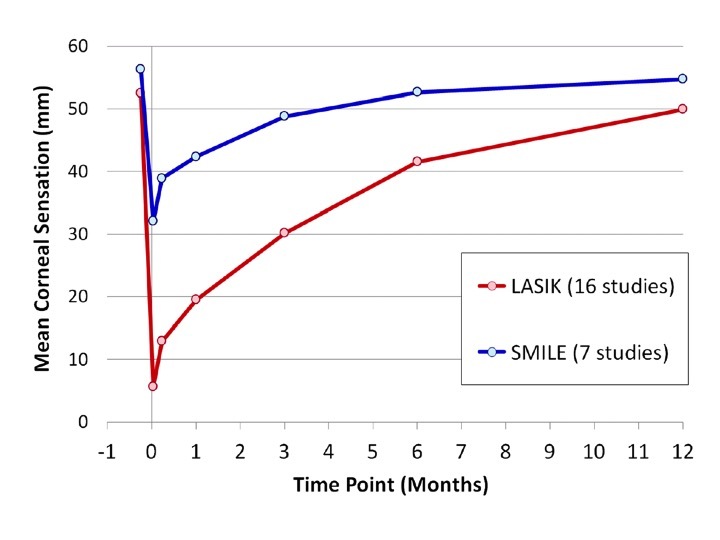 Read about other advantages of the SMILE method from the Zeiss website.